In everyday life we pick up patterns of movement through repetition. These movement patterns sometimes overwork one muscle group allowing the opposing muscle group to lengthen or become "lazy", creating skeletal imbalance, tightness or even injury. Our instructors, the movements and exercises we use, strive to get you exercising in proper form, alignment and balance, lengthening shortened/tight muscles and strengthening elongated/weak muscles caused by these movement patterns. Intelligent Exercise focuses on biomechanics, form, function and movement integration to improve or eliminate pain as well as improve the performance of elite athletes. Joseph Pilates stated, "[These movements] develop the body uniformly, correct wrong postures, restore physical vitality, invigorate the mind, and elevate the spirit." Pilates is a mind-body movement technique which combines resistance training with conscious breathing and skeletal alignment, improving movement quality, efficiency of movement, strength, flexibility, coordination and focus. Your overall energy level will increase while creating a strong, lean, flexible, capable, and aware body. Professional, amateur, and recreational athletes will benefit from the functional training aspect of Pilates as well as Personal Training at Intelligent Exercise. Functional and sports specific movements are performed while strengthening the core to improve strength and flexibility while challenging your balance, coordination and concentration. Because of the gentle and low impact nature of Pilates, modifications to the movements are performed to empower special populations to maintain an exercise program for their needs. Pilates is ideal for special issues including low back pain, pregnancy, osteoporosis, and injury recuperation. Call our studio to find out if we can help you maintain consistency in exercise while focusing on your special needs. Joseph Pilates created this technique in the early 1900's. Its foundation lies in Yoga, gymnastics, and calisthenics. The technique uses the body's own weight for resistance, or with the equipment, springs are utilized to either support and assist the body or increase resistance and intensity. Proper form in this method is vital to balance the skeleton and achieve long, lean and aware bodies. See below, "About The Pilates Method" for more information. Bodhi in Sanskrit means “to awaken”. The Bodhi Suspension System stimulates the deep support systems in the body to create integrated, functional, fluid movement. The system includes two independent ropes which, when installed, create four suspension points. This allows for endless opportunities to suspend the body from each of the four points or all at the same time. The four independent points of suspension create an environment where balance, strength and flexibility work together to create a more active, more alive exercise program. Based on current research, our fascia, or connective tissue, is the key to range, strength and rebound capability of our muscles. This method is a full body integrative approach and utilizes concepts including: rebound and release, proximal initiation, full body movement, flow, dynamic changes and tissue re-hydration. Sessions create a feeling of relaxation, balance and elongation, but are also deep muscle and connective tissue strengthening. Our current way of life creates patterns in our postures. The Core Align was originally created to improve postural imbalances, standing balance and gait. The two-cart system highlights strength imbalances and naturally forces our body to stabilize. 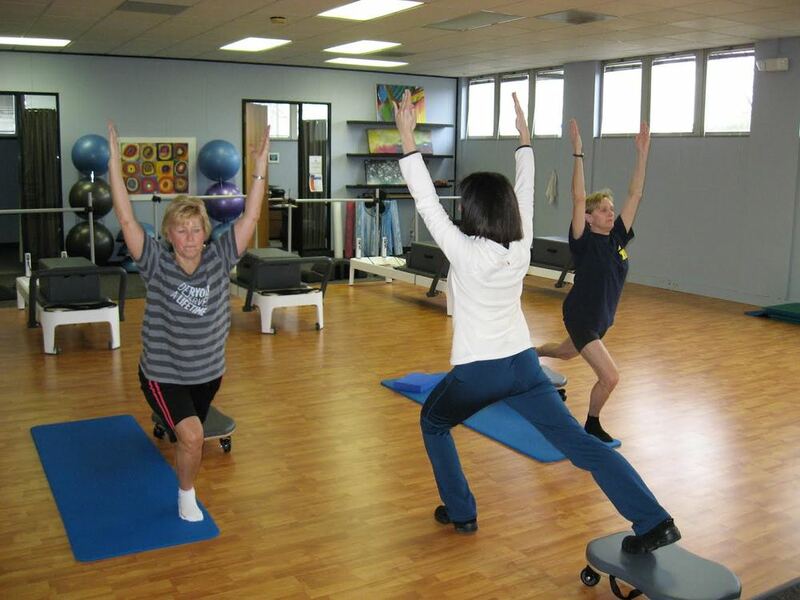 Many exercises are done standing which makes this a perfect method for Seniors and clients with Osteoporosis. The advanced levels on the equipment will challenge even the strongest and high elite athletes to improve power and function. This method is based on improving strength and cardiovascular capacity utilizing interval techniques combining cardio exercises and resistance training. Functional movement is used to mimic sports and activities of daily life. Intensity level can be increased to improve cardio capacity and explosive strength, or slowed down to improve balance, agility, control and endurance. Our Barre classes are designed specifically for adults who want a really fun, challenging full body workout. We work hard but not at the expense of joint or back health. We combine a ballet barre series, short cardio dance section, resistance training and core work for the best and safest barre class in Ann Arbor. In it's most basic form, Pilates is resistance training and increases muscle mass and density. However, the deeper muscles are the focus: those which surround the joints or are deep in the abdomen to help increase joint, skeletal, core and full body stability. Pilates helps to increase core strength while simultaneously toning and increasing flexibility. Skeletal balance and alignment are the initial goals to help build core strength and stability, reduce pain, and/or increase joint range of motion. In the more advanced stages, full body work is performed constantly to achieve tone, grace, and deep strength throughout the body. It is gentle on the joints, but challenging for every level of exerciser from special needs, to seniors, to weekend warriors, to elite athletes. The benefits include increased body awareness, deep strength, pain reduction, injury prevention, increased tone throughout the body and increased flexibility. The Cadillac is often the jaw dropper when someone new walks into a Pilates studio. It is the ultimate in adding a gravity challenge to your workout. The Cadillac was originally created to assist soldiers in recovery. This piece of equipment can be used for rehabilitation and extremely advanced exercises making it one of the most versatile pieces in the Pilates studio. Far from being a newcomer on the block, the Pilates chair, also called the wunda chair and the low chair, has always been a part of any fully equipped Pilates studio. Lately, the chairs have been getting a new look, moving into the mainstream and losing their status as one of the "mysterious" Pilates machines. Although the chair looks less intimidating than other Pilates equipment, the workouts done on the chair can be deceptively challenging because almost all of the exercises require use of the entire body. 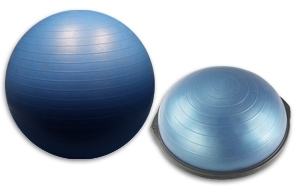 Both the Swiss Ball and Bosu increase the intensity of Pilates and other workouts by adding instability due to the round surfaces. The body works to stabilize itself using deep core muscles with any exercise performed on either of these two pieces. The Orbit™ exercises include both circular and linear movements, and range from mild to complex. You are working with caster wheels which increase instability in two planes. It’s an amazing core workout because your abdominal muscles are always engaged. You will also increase upper body and lower body strength, and improve flexibility and balance. An all-around great mind-body workout. The Pilates Arc from Balanced Body helps users build core strength and enhance spinal, shoulder, and hip mobility. The lightweight workout device, inspired by Joseph Pilates' original spine corrector, can be used in fitness centers, in studios, and at home. The equipment may help relieve back pain by improving posture, building flexibility, and correcting spinal alignment. With a gentle curve on one side and a steeper curve on the other, the product is user-friendly for many body types and strength levels. The Pilates magic circle is a flexible ring, usually metal, with padded handles, about 13 inches in diameter. The magic circles are used to provide resistance and neuromuscular feedback in an exercise. They are especially popular for toning the arms, chest, hips and thighs. One of the best ways to strengthen the back muscles through back extension exercises, the ladder barrel has many uses. In the beginning levels the barrel is used for stretching to gain flexibility throughout the body. But because there are no springs to 'assist' in the exercises, it is one of the best (and most challenging) ways to strengthen core muscles which include the front, side and back of the torso. While not traditional Pilates equipment, the fitness band has become a popular tool in Pilates workouts by providing exercise resistance enabling proper use and deeper engagement of muscles. Bands have been used in the past mainly as therapeutic tools but have become increasingly popular in the Pilates and workout world for both stretching and strengthening.